They really manage to get a lot of text on these things, don't they? It's because of the way the packaging is laid out. Instead of putting the bio on the back, it's printed sideways on the side of the box in tiny, tiny letters (guys, come on: Matura MT Script Capitals is not a text font, it's a display font; it's garbage for big blocks of copy, especially when you drop it down to 5 points). The box itself is bright white, with a window in the front allowing you to see the figure within. The cardboard insert behind the figure is designed to look like a sliding paper door, fitting the theme of The Feudal Series. The side opposite the nigh-illegible bio text features a large image of the character, making this a box that will display well even sideways on a shelf. I didn't go "all-in" on the Articulated Icons, so the figures I did get all had some kind of reason behind them - mostly to be Marvel stand-ins. Since that's definitely not the case with Itami, here, all I can figure out is that he reminded me of John Belushi's samurai, what with the scruffy beard and the topknot and so forth. There's a bit of a paint smudge on my figure, but it just ends up looking like dirt or a bruise, so it adds personality to him. 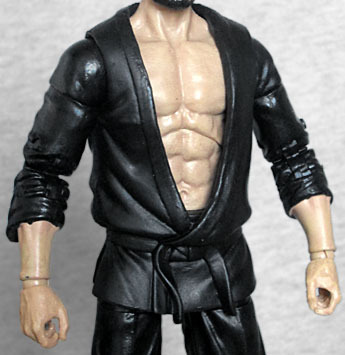 Despite being dressed in black (because he's eeeeeevilll), Itami is more than just a new head popped on the Black Ninja body. In fact, other than the upper legs and the groin, nothing seems to be the same! The ninjas wore a tight-fitting outfit, while Itami is more loose and casual. His shirt hangs open, revealing his sculpted torso, and his baggy sleeves end just below the elbow. Instead of disappearing into wraps around his shins, his pantlegs are open above the ankle. In keeping with his "no pain, no gain" mentality, he wears no shoes - no need to coddle his little piggies, they're tough enough to deal with whatever stones the road may put in his path. The bodyparts may be new, but the articulation is the same; that means it's still great! 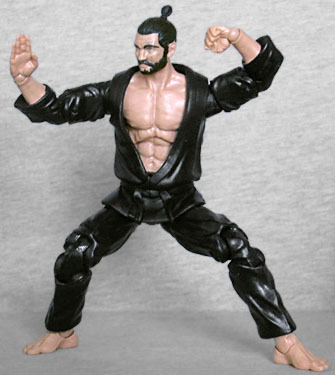 Itami has swivel/hinge ankles, swivel shins at the ends of his pants, double-hinged knees, swivel thighs, balljointed hips, swivel waist, a swivel/hinge torso, balljointed hands, swivel/hinged wrists, double-hinged elbows, swivel biceps, swivel/hinged shoulders, a hinged neck and a balljointed head. The hips continue to be very stiff/sticky, but there's no way those will see any fixes before Series 2. The shirt is made from PVC, so it flexes out of the way when you move the figure beneath it. His accessories are few, but they suit him. He's armed with a sword in a scabbard, and two sais. That's it. He does have the extra hands - fists and chops - and a mask. 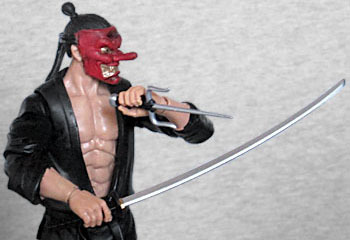 This isn't the same hannya mask the deluxe ninjas had, but rather a tengu mask. Not this kind of tengu mask, a real one: tengu demons were most often portrayed as half-bird, but when humanized, those big beaks became exaggeratedly long noses. The mask itself is red with golden eyes and teeth, and fits over the figure's head perfectly. I can't say for certain why past-me bought Itami - that guy's a huge jerk who's always spending my money before I get a chance to. But the figure is nice, and at last I get to appreciate some alternate parts, rather than more of the same. I'm glad I've got him, and now I just need to figure out where I'm going to display and then store him... but that's future-me's problem.